First, there was a book by Graham Greene then a movie in 1947 and then this, the 2010 remake of the film. It follows a sociopathic gang member, Pinkie (Sam Riley) who marries Rose (Andrea Riseborough), a waitress who witnesses some violent acts. Her old boss Ida (Helen Mirren) sees the danger Rose is in and tries to help her. I was bored throughout this film. I didn’t find any connection to Pinkie at all, he was just a prick and I wanted him gone. Rose was alright but her naivety annoyed me. And even the violence was tedious. 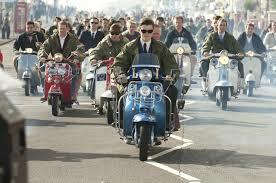 Then only thing I really enjoyed about the film was the set and costume design – Brighton in the 60s looked awesome, and the outfits of the Mods and Rockers were very cool.